Difference between revisions of "EMF Compare"
The EMF Compare project is [http://www.eclipse.org/emft/projects/compare/ part of EMFT] (EMF Technology). The EMF Compare project is [http://www.eclipse.org/modeling/emf/?project=compare part of EMF] (Eclipse Modeling Framework). EMF Compare brings model comparison to the EMF framework, this tool provides generic support for any kind of metamodel in order to compare and merge models. The objectives of this component are to provide a stable and efficient generic implementation of model comparison and to provide an extensible framework for specific needs. You may also contact the team using the EMFT newsgroup. You may also contact the team using the EMF newsgroup. The EMF Compare project is part of EMF (Eclipse Modeling Framework). The comparison process is divided in 2 phases: matching and differencing. 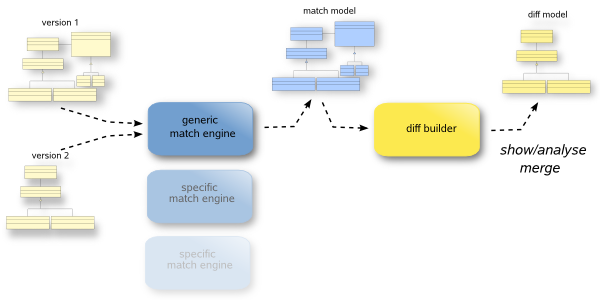 The matching phase browses the model version figuring out which element comes from which other one, then the differencing process browses the matching result and create the corresponding delta. This delta may itself be serialized as a model. An empty cell indicates that the compatibility hasn't been tested for a particular combination. Any issue should be reported to the Bugzilla You may also contact the team using the EMF newsgroup. 10/10/2007 - Talk given at Eclipse Summit Europe 2007 EMF Compare : One year later. 05/03/2007 - We presented the project at EclipseCon through a panel. Here is some feedback: Model Comparison Panel 2007.